Update: 5/21/11 Added dates for Chip and Dale’s release. Update: 3/2/11 Tailspin went online for $26.95 and then Disney went back and changed all previous mentions of the price to $26.95. Does that mean the rest of the series will change price? Doug is featured in his sneakers and classic green sweater. Porkchops looks normal standing on two legs as a Vinylmation, because he did so in the cartoon as well. The dog has his yellow collar around his neck. Including it’s Nickelodean years, Doug ran for 7 seasons with 117 episodes. One interesting note, Nick’s Doug had 8 hairs on his head, Disney’s version had 9. Any one disappointed Patti Mayonnaise isn’t the second character? Check out Baloo and Kit Cloudkicker. Baloo’s hat even comes off. Gosalyn Mallard and Darkwing Duck are featured in this combo. All sets in this series have accessories. DW has his signature hat. When will Disney step it up one more notch and include capes? Come on, surprise us with the final release. Chip ‘n Dale are ready for adventure in this combo set. Love the Hawaiian shirt! Great looking hat too. Goofy and Max make up this set. The big reveal here… Max has a skateboard! That’s an unexpected accessory for sure. Will it be removable? I hope so… because nothing will be better than a skateboarding Stormtrooper. Who else, but Scrooge McDuck and Launchpad McQuack for this set. Scrooge has his top hat of course, but after seeing what Max gets, wouldn’t it be great to have an accessory pile of money for Scrooge to stand on? What’s your favorite Disney Afternoon cartoon? Pics from the Disney Parks Blog. omg! 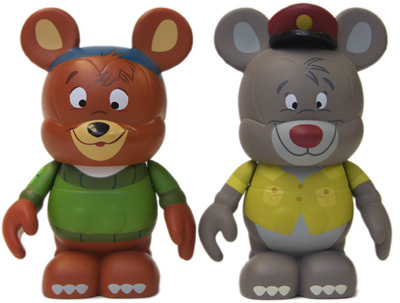 i love vinylmations i love chip and dale so im going to try and get those! yay! they come out this Friday! i don’t know that i consider Doug any part of the classic Disney Afternoon. So many more that could’ve/should’ve been first. and come on… i’m scrambling to get a chip and dale. Darkwing may have been my second favorite. complete with action figures and the his plane (which i believe i still have). I actually just updated the post with some info on the show… it was on Nick from 91-94 then moved over to Disney. If I’ve said it once I’ve said it a THOUSAND times. I hope these new vinylmation are in the old mold and not the hideous new mold. Old mold=Disney gets more of my $$. New mold=I keep more of my $$. I wouldn’t consider this a Disney show either. It was never even on the Disney Channel, it was on ABC and only the last 2 seasons I think. As a kid I watched it when it was on Nickelodeon, so to me it’s a Nickelodeon show. What’s up with Darkwing Duck? If you take a look at the sneak page on the official vinylmation site, there is no picture of it. And also, ABC and Disney killed Doug when it left Nick- the Brand Spankin’ New Doug was Brand Spankin’ Awful. Call me crazy, but look at this listing on ebay and tell me that the vinyl 2nd from the right in the back doesnt look strangely like the doug artwork? I can’t figure out what other series it would have come from because it doesn’t look familiar. Stephanie I think you’re right. That listing is definitely a Scrapper lot. Looks like the paint on Dougs face is messed up. It is clearly the Doug though, Look at the ears and Sweater. I Just wish Skeeter would have been the second design in this set. I can’t wait for this! I grew up watching Doug on Nickelodeon. The Disney series wasn’t as good but I still loved it. I don’t really like that it’s being released in the Disney Afternoon series because it was never on Disney Channel it was on One Saturday Morning on ABC but It does make me wonder if other OSM shows will be released too. Recess? Pepper Ann?